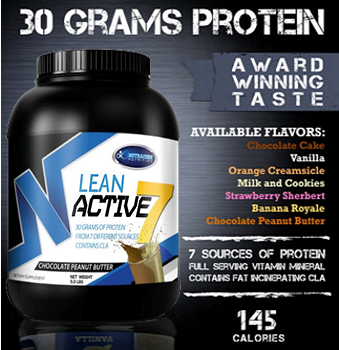 LEAN ACTIVE 7 is a specific blend of 7 high quality natural proteins from Whey Isolate, Whey Concentrate, Whey Peptides, Egg Protein, Casein Protein (Calcium & Potassium) and Milk Protein providing an “extended release” protein profile. The different absorption rates for the proteins allow for a more extended “feeding time” and a more complete amino acid pool for the working muscles. LEAN ACTIVE 7is High in Dietary Fiber from the trademark Fibersol® -2. It also contains a full spectrum vitamin mineral blend to aid in muscle nourishment as well as a digestive enzyme complex to ensure maximum digestion and alleviate bloating, commonly associated with protein. 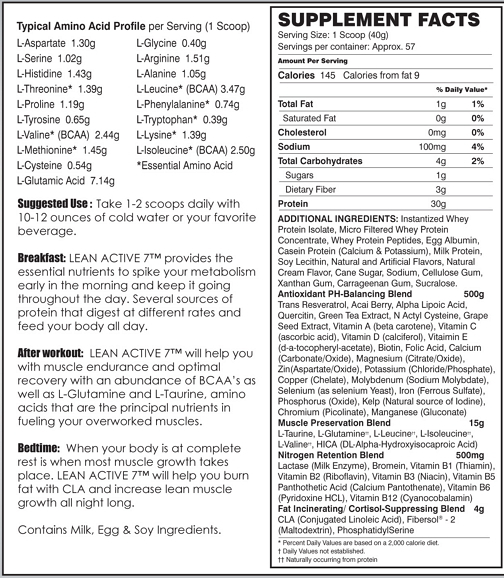 LEAN ACTIVE 7 is high in branch chain amino acids and contains several grams of L-Glutamine and L-Taurine for maximum recovery. This next generation protein shake also contains Conjugated Linoleic Acid (CLA) which works to block certain enzymes that let fat cells swell. This process helps control our bodies weight. 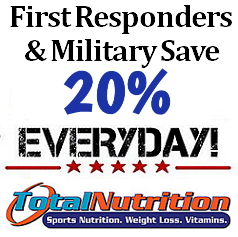 If using post-workout, add 1-2 scoops of Carbalean and 1 scoop of Glutaplex for full recovery. Available Flavors: Delicious Chocolate Cake, Vanilla, Cookies & Cream, Orange Creamsicle, Strawberry Sherber, Chocolate & Peanut Butter and Banana Royal!